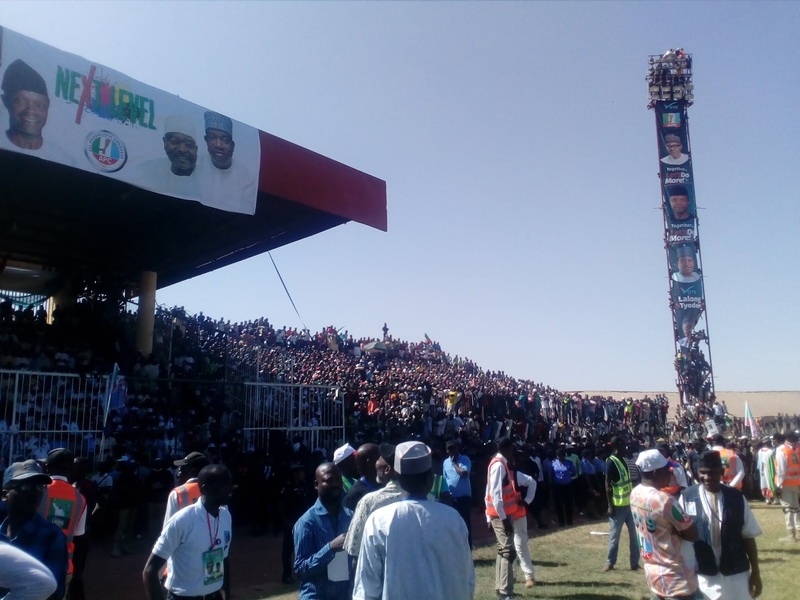 Inestimable crowds of overexcited supporters of the All Progressives Congress, Saturday over flooded the Rwang Pam Township Stadium in Jos, venue of the Plateau State Presidential campaign rally. 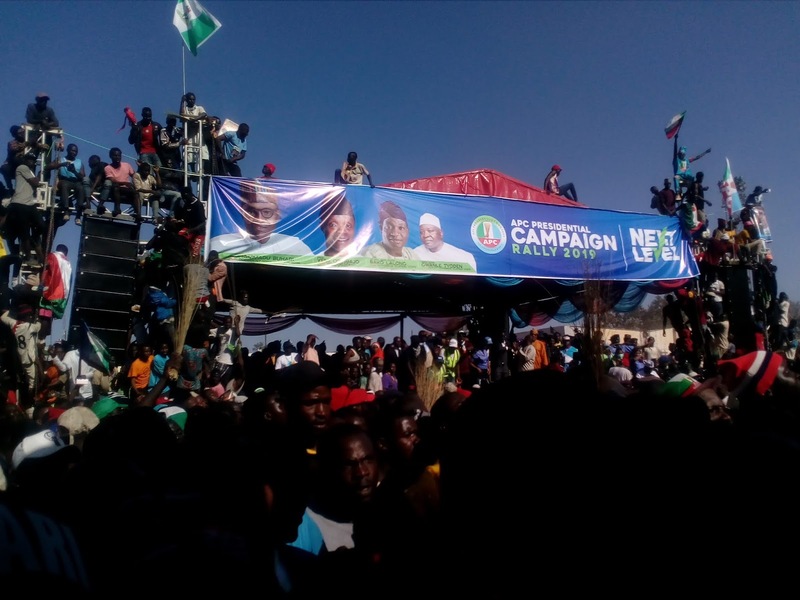 The ecstatic crowds swum over light poles, fence and roof of the stadium's VIP gallery just to have a glimpse of President Muhammadu Buhari. Broom bearing crowds began being noticed at strategic locations in the city from as early as 8am in anticipation of the President's visit. Securities were seen all over the city trying to maintain law and order. All nonofficial individuals including journalists were forced to trek to the event venue from several kilometers. The venue of the event was relatively calm and controlled until the Master of Ceremony announced that securities should stop preventing people from accessing the venue. That announcement made at about 2:15pm saw to an unprecedented avalanche of rowdy crowds, some of whom carried swords, clubs and other deadly objects. Although no physical violence was noticed anywhere, some youths from the crowds used rocks and other objects to break down the entrance gate and iron fences of the stadium. 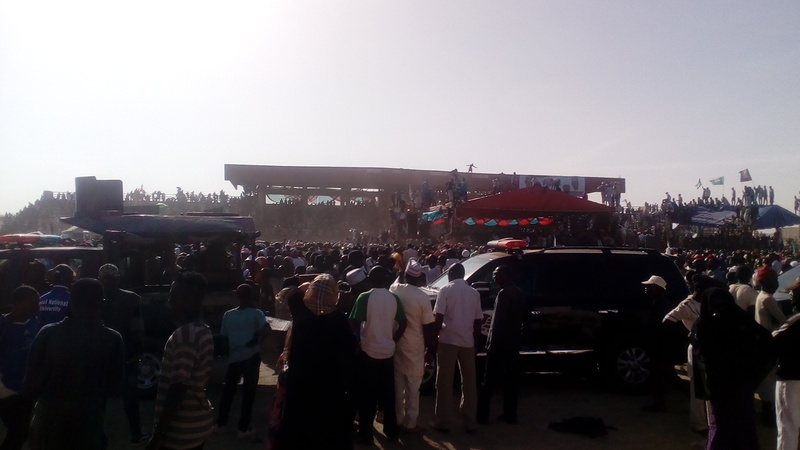 President Muhammadu Buhari who arrived the event venue few minutes to 4pm could only wave his broom in the air as he watched in obvious bewilderment the uncontrollable crowd that came to welcome him. Gov. Simon Lalong and other officials appeared unhappy about the situation as some youths from the crowds flooded the podium from which guests were expected to deliver addresses. In fact, the President and every other guest after standing helplessly for a while left without a word as the rowdy crowds appeared to have damaged the connections to the Public Address System. Mr. Buhari does not however seem bothered by what he experienced. A statement from his Special Adviser on Media, Femi Adeshina shortly after his departure from the Yakubu Gowon airport, Heipang says "the President lauds Plateau people for turning out in their thousands to welcome him into Jos, lining the roads right from the airport, defying the boiling sun." That statement may have eased the frustrations of the State Governor, Simon Lalong over the experience as he followed shortly with his own statement appreciating the support of the people. 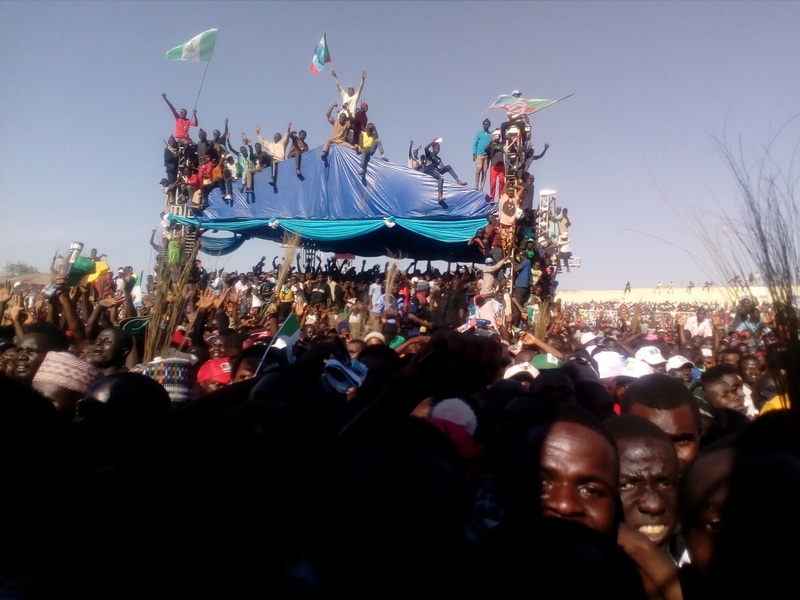 "Governor Simon Lalong says the unprecedented massive turn out of Plateau people irrespective of party affiliation is not just a demonstration of love for President Muhammadu Buhari and the All Progressives Congress but an endorsement of the success of the Rescue Administration in the state," the statement signed by Yakubu Dati, the state information commissioner said.